Multidisciplinary design optimisation (MDO) is nowadays widely employed to obtain advanced turbomachines design. The high rotational speed of such machines, especially if used for micro cogenerative power plants, coupled with high exhaust gas temperature, exposes blades to really high centrifugal and thermal stresses; thus the aerodynamics optimisation has to be necessarily coupled with the mechanical one. 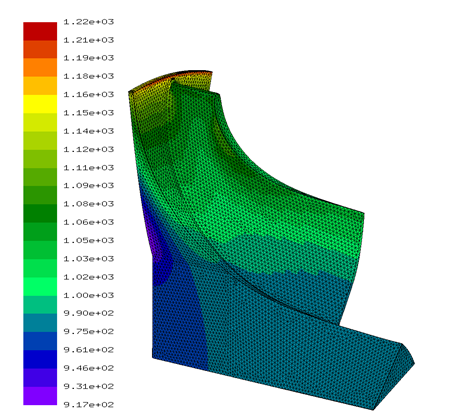 Such an approach involves two different computational tools: a fully 3D Reynolds Averaged Navier-Stokes (RANS) solver is used for the aerodynamic optimization, while a Finite Element Analysis (FEA) solver is employed for the mechanical integrity assessment. The aerodynamic mesh generation is managed via dedicated tools provided by the CFD software and it is a fully structured hexahedral multi-block grid. The FEA mesh is built by means of a harmonic map approach, which is able to provide high quality second order unstructured grid preserving geometrical features starting from boundary surfaces of the fluid domain. The finite element calculation provides stresses, displacements and eigenmodes that are used for mechanical integrity assessments while the CFD solver provides global performance parameters and local thermodynamic quantities. Due to the high computational cost of both these two solvers, a metamodel, such as an artificial neural network, is employed to speed up the optimization process. The interaction between two codes, the mesh generation and the post processing of the results is obtained via in-house developed scripting modules. In the last years micro-gas turbines used in cogeneration power plants have been proved to be a promising technical solution for distributed combined production of electricity and heat, especially due to their low emissions and fuel flexibility. Components efficiency heavily affects plant performance and aerodynamic design of novel geometries has to consider mechanical constraints in order to pursue this target without compromising machine integrity. The preliminary design of the radial turbine impeller is usually based on statistical correlations and semi-empirical procedures. The further aerodynamic design through CFD optimization techniques leads to the definition of a proper geometry configuration able to fulfil the requested aerodynamic performance and to monitor some peculiar aspects such as Mach number field, and separation control along the meridional channel and blade incidence angle. On the other hand, geometrical parameters modification inevitably involves structural and mechanical aspects that have to be considered and taken into account. For example, a large lean angle can improve aerodynamic efficiency but, at the same time, induce high bending stress dangerous for the mechanical integrity of the impeller. Nowadays, next steps of improvements are based on multidisciplinary optimisation, because the aerodynamic design has to be strongly coupled with mechanical assessments. The optimisation procedure is focused on efficiency enhancement guaranteeing a safe turbine operation, by limiting stresses and avoiding resonances. The method is based on the minimization of a properly defined objective function, modelled through an artificial neural network (ANN). The ANN is defined by setting the number of layers and a solutions database provided by CFD calculation obtained via DoE technique. After the training, the genetic algorithm (GA) employs the ANN as a meta-model in order to find the partial optimum solution, which is verified through a CFD calculation. The result is inserted in the database to update the ANN training. This procedure is repeated for the desired number of optimisation iterations. For the turbine geometry optimization database, as the number of variables is quite high, a 15X random sample has been chosen. The range of variation of each parameter has been split in four intervals, letting each parameter assume five different discrete values, and about 350 sample CFD calculations, chosen with a pseudo-random technique called “random among discrete levels”, have been employed. In fact, other DoE schemes would lead to too expensive sample. Each computation is run in serial, but the overall database generation has been split over several CPUs. In order to create the FEM mesh starting from the CFD one, a complete automatic procedure has been developed through a Python script. Aerodynamic geometry of blade and channel is provided by the CFD solver in STL (STereoLithography) format. Then, in order to create a water-tight solid volume, the two periodic surfaces, the back and the front hub faces of the impeller have been built up, always in STL format, via a Python script. Normally during this procedure some errors can occur (e.g. facet orientation, degenerate facets ), so, in order to obtain a robust optimisation procedure, a further step has been defined: all STL triangles are checked and, in case, fixed by an opensource program for processing triangulated solid meshes. 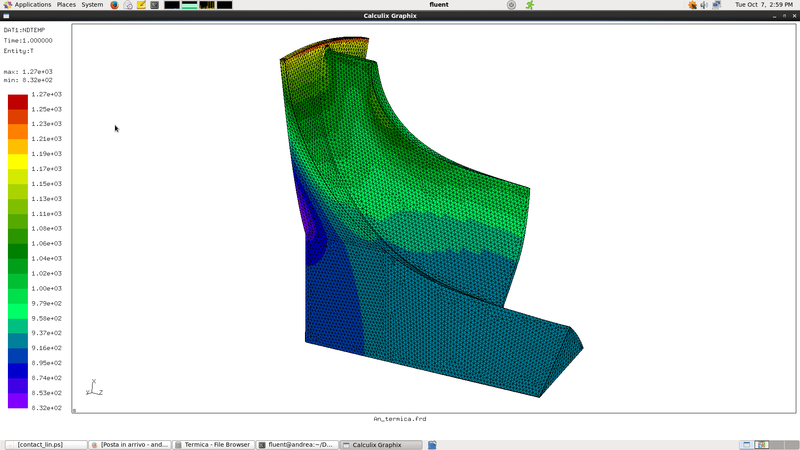 After that, mesh is exported to an open source three-dimensional finite element mesh generator. it creates the 3D mesh of quadratic tetrahedral elements, by using the Delaunay algorithm. For thermal analysis a simplified approach has been adopted, by imposing adiabatic temperatures coming from CFD solver (interpolating from CFD to FEA mesh through a FORTRAN script) and by setting appropriate heat transfer coefficients and bulk temperatures in the zones not in contact with the main flow. Once the calculation has been performed, temperature and Von Mises stress fields of the blade are then extracted. For a preliminary assessment an allowable stress has been defined, based on yield strength, expressed as a function of temperature. Then, Von Mises stresses of each blade node have been compared to the allowable ones. Since the disk is rotating and subjected to pressure and thermal loadings, there is a preload. Therefore, the first step is a nonlinear geometric static analysis in order to calculate the deformation and stresses due to this loading; this preload is taken into account in the calculation of the stiffness matrix in the frequency calculation. 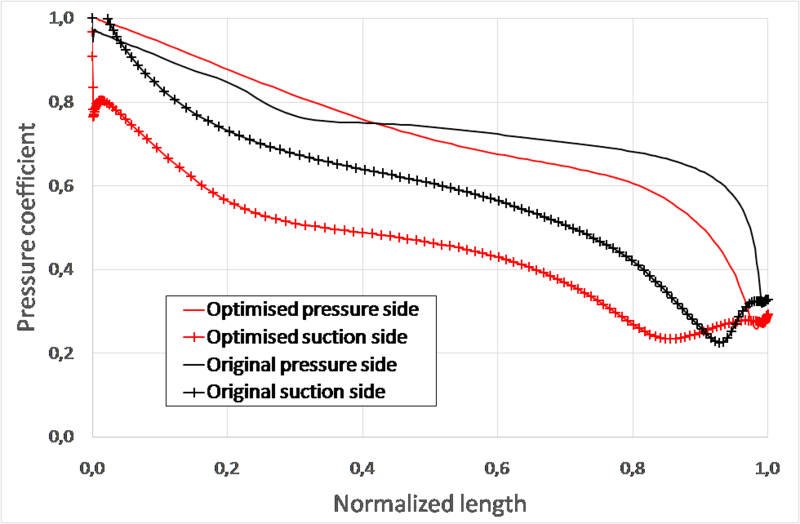 For the baseline configuration (black curves) the pressure and the suction side lines intersect just behind the impeller leading edge, suggesting the occurrence of a pressure side boundary layer separation due to excessive negative incidence angle condition. In the optimized case the optimization tool increases the absolute flow angle at the rotor inlet (reducing the channel height and raising the exit metallic angle from the stator blade), thus minimizing the incidence angle at the impeller leading edge. This re-establish a right incidence condition to the impeller, as shown by the loading distribution in the optimised case (see the red lines). The original and optimized overall performance are summarized in the following table. The aim of the work was to illustrate a multidisciplinary procedure capable of increasing aerodynamic efficiency and improving mechanical safety for high speed radial gas turbines. The coupling has been obtained via in-house developed Python and Fortran scripts suited for the current application. free from resonance behaviour of the impeller, in the speed operating regime, for the sources of excitation considered.